The Gavin Crawford show at the Toronto Sketch Comedy Festival started twenty minutes late, but the venue sold beer and cookies, so it was a pleasant wait. When he did appear onstage it was in the persona of Kathleen Wynne, which I loved because I am a political junkie and because he really did look a lot like her. Granted, Crawford is quite the chameleon who almost eerily becomes the person he is spoofing, but Wynne seems a particularly perfect character for him. It’s also particularly apt for Ontario’s first lesbian premier to feature in a show as gay as this. How gay is it? Well, the title is Shitting Rainbows. Other excellently gay aspects included two scantily-clad male go-go dancers, an ode to Grindr sung a la Cole Porter, and, well, Rufus Wainwright. The Wainwright sketch is particularly pertinent to Torontonians since it parodies the singer having recently deigned to move to the city, which he has previously publicly disparaged. (“It’s like urban Pleasantville.”) It also allows Crawford to simultaneously do two things he does very well: imitate an odd-sounding voice, and sing. Particularly pertinent to Torontonians (but unfortunately a source of humour for the entire world, it seems) is Rob Ford, and Crawford’s take on him is incredibly unique and definitely the highlight of the piece. And I say that as someone suffering from a serious case of Fordtigue. I really like Gavin Crawford, but if I ever go see him again, I will have to take up watching Downton Abbey first. This is the second time I’ve been to one of his shows and both had a substantial piece on the British period drama, which I’ve never seen. There was also another scene, a filmed one, where I had no idea who the character was – it seemed to be a French-Canadian television journalist of some sort. Other people in the audience, including the people directly behind me, thought it was hilarious though. One scene set on a big gay cruise ship got off to a slow start, but we were all chuckling by the end. But a story that Gavin told from his real life, that happened aboard a partly-gay cruise ship and involved finding out about strange Swiss customs and arguing with Americans about Thanksgiving, was wonderful. As good as his impressions are, I really enjoy the times when Crawford speaks as just himself. It was really charming to hear him talking about how annoying he must be for his boyfriend to live with. It’s true, his boyfriend must have a high tolerance for funny voices. But I bet it’s totally worth it. 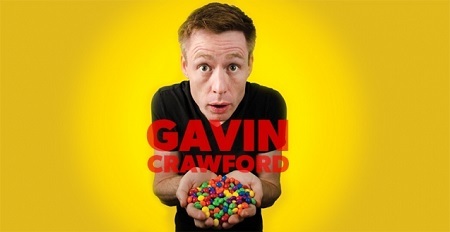 If you like to laugh, especially if you like things a little bit gay (or a lot gay), you will want to go see Gavin Crawford: Shitting Rainbows, if he ever remounts it again. Or just go see Gavin Crawford, whatever it is he does next. SketchFest offers a 4-show pass for $50 + HST; contact the box office (boxoffice@torontosketchfest.com / 647-505-1050) or buy tickets online. Previous PostReview: 2 Humans, The Rulers of the Universe, and The Templeton Philharmonic (2014 Toronto SketchFest)Next PostMooney on Theatre is looking for Editorial Volunteers! Chantal Hébert is the French Canadian journalist — at least the one he used to do on 22 minutes. She even appeared with him on that show one time. the real Chantal’s usually on the National with Peter Mansbridge on Thursdays. Yes, Gavin confirmed on twitter than Chantal Hébert is who he was doing. I think the take home lesson here is that I need to watch a lot more TV!